Moments of clarity can strike at the most unexpected time. For Cyril Donnellan, an All-Ireland winner with Galway last year, the realisation that his race with the Tribesmen was run came as he waited for an X-ray on his ribs after he sustained a bang in a club game last autumn. At that point, he had fully intended on getting on the horse for one more year. He’d put nine hard seasons down before finally getting over the line last September. And having hurled in purgatory for so long, maybe he figured there was a chance of another Celtic Cross. But reality has a way of finding you. And on his wait for an X-ray, Donnellan realised his time was done. “It was just a bit of me-time and I thought after September that the run of form and the run of no injuries for July and August, that that would happen for a full year next year and I started thinking of the probability of that happening was very slim,” he explained at yesterday’s launch of the 2018 Croke Park Charity Challenge which allows companies and individuals to buy a spot in the game for €3,000, with all funds raise going to Self Help Africa. So he met with Micheál Donoghue and informed the Galway supremo that his time was up. 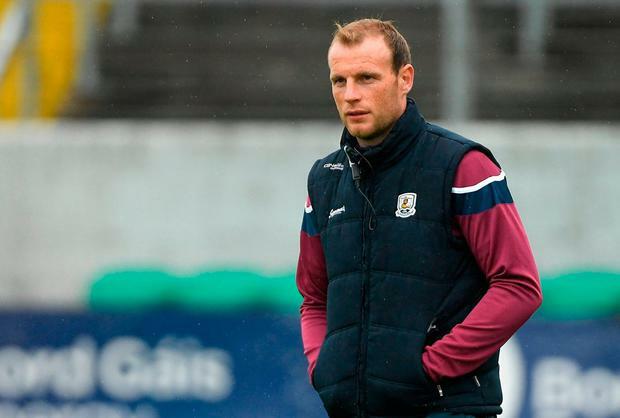 But as one door closed a window opened and the Galway manager offered him a chance to move into coaching. “After the All-Ireland my immediate thing was to hang on for another year and I cracked two ribs in a club game and spent three hours in X-ray one evening and just put things into perspective that enough was enough. I kind of made my decision that day. “I met Micheál a few weeks later and he probably knew what I was coming with and asked me to see would I get involved in the coaching side of things with the 21s although he wasn’t the manager. “Franny Forde is involved with both so that conversation developed, if I was interested he would contact the U-21 manager for me. So I was delighted to get involved in that. “From talking to past players, it can be a dip when you leave that and it’s a void you have to fill with something so I filled it with a bit of coaching. I’ve been busy with that. Galway have rumbled on and are now within one game of emulating the men of 1987/’88. “You’d be worried that Limerick are an excellent-calibre team, what they’ve done in the semi-final and the Kilkenny game, those two games alone, like, it’s not impossible what they’re trying to do. In 2012, Galway were a very young team that got to a final, obviously didn’t win it, but went very, very close so you would be worried. “The word is that they could be a small little bit naive, but naive in a good way, that they’ll just embrace the day and go at it because they’re a young team.